Hyper-converged infrastructure can be defined as a software system architecture which brings together multiple data center services to amplify computing, networking and storage to improve performance efficiency and reduce costs. Globally, rising usage of virtualization, increasing need of data protection & disaster recovery, low capex & total cost of ownership are the prime growth drivers of hyper-converged infrastructure market. In addition, development of technologies to create high value hyper-converged infrastructure and increase in adoption of hyper-converged infrastructure in emerging economies such as China, India and others, is expected to create new opportunities for hyper-converged infrastructure market. However, higher cost of the research and development, demerits of bundled solutions are the key restraints for hyper-converged infrastructure market. Geographically North America dominated hyper-converged infrastructure market owing to higher demand of hyper-converged infrastructure in the U.S., as a result of presence of a major technology giants across the U.S., coupled with presence of the major IT & telecom and BFSI companies. Asia Pacific is projected to have fastest growth, owing to rapidly increasing adoption of the modern IT services to store data at an economical cost, growing awareness for data management, rising focus toward VDI, server virtualization, increasing popularity of using infrastructure-as-a-service (IaaS) solutions, and favourable government policies in developing nations such as China, and India in this region. Among all the end-user industry, healthcare has the highest market share in hyper-converged infrastructure market. This report identifies the hyper-converged infrastructure market size in for the year 2015-2017, and forecast of the same for year 2025. 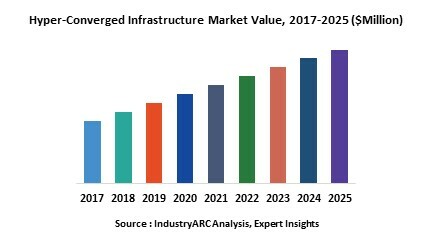 It also highlights the market drivers, restraints, growth indicators, challenges, and other key aspects with respect to hyper-converged infrastructure market.